Liberty Jones is tired of war – he fought hard in the Civil War, saw great suffering and endured much himself. Now all he wants is to be left in peace, but trouble has a way of finding him. He rides into the town of Red Rock to escape a marauding tribe of Indians, but any hopes of safety he may have held are soon dispelled. For the town is under military command and facing a gathering of great Indian tribes who are determined to drive the people from the town and reclaim their land. Liberty, along with a rag tag band of townspeople, must face impossible odds and soon blood will run deep in the streets of Red Rock. 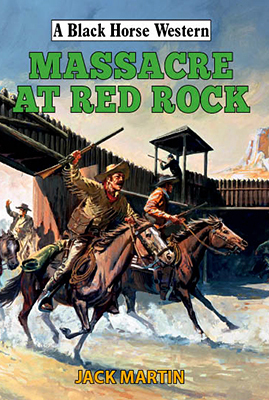 Massacre at Red Rocks is a very fast paced book that is more or less filled with non-stop action as the mix of Indian tribes launch attack after attack on the town. There are brief explanations as to why the military won’t give up Red Rocks and why the Indians are so determined to destroy the town. Jones is at first at odds with Captain Roberts but this soon becomes a grudging respect as the fighting ability of Jones becomes apparent to the soldier. There are one or two lighter moments amidst the carnage, such as when Jones and the English gambler, Sinclair, get arrested. This leads to the pair meeting an old-timer in jail which gives birth to the tales' sub-plot. There are a couple of tips of the hat towards favourites of the author, such as naming the English gambler Lord Simon Sinclair – a mix of names of two of Roger Moore’s famous television characters, Simon Templar (The Saint) and Lord Brett Sinclair from The Persuaders. Knowing that Jack Martin is also a massive fan of the third Edge book, Apache Death, by George G. Gilman, there are certainly nods of the head to that story too. All of this added to my enjoyment of the story. Jack Martin is a pseudonym used by Gary Dobbs, and he has certainly come up with a very entertaining tale that should satisfy all of us who like stories packed with action. Borrachón is a prequel to the Rio Bravo story, a 1959 film directed by Howard Hawks and starring John Wayne as Sherriff John T. Chance, Dean Martin as Dude (Borrachón) and Walter Brennan as Stumpy. 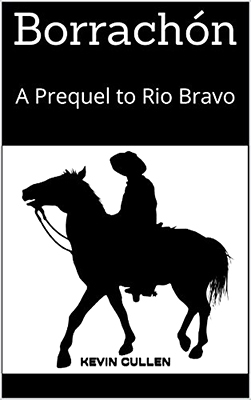 Kevin Cullen first novel fills in the background to the main characters of Rio Bravo in a very entertaining story. John T. Chance doesn’t have a very large role to play in this fast moving tale that revolves around a cattle drive to provide Stumpy with much needed funds to pay his ranch off. Of course someone doesn’t want that to happen and there’s a lot of violent action as hired guns attempt to stop the drive. The other main thread of the book follows Dude’s fall from grace as a first class deputy and his new dependence on alcohol which leads to his new name of Borrachón. Cullen also injects some humorous scenes to lighten the darker elements of his story. If you’re a fan of the film Rio Bravo or just well told western tales then this is certainly a book you should consider reading, and if you do, I think you’ll be joining me in wanting to watch the movie again to remind yourself of what happens next. Butch Shilton and Joe Peters are on the run and think to hide out in a quiet township. The sheriff comes across them on a wanted poster and once again they have to hightail it. 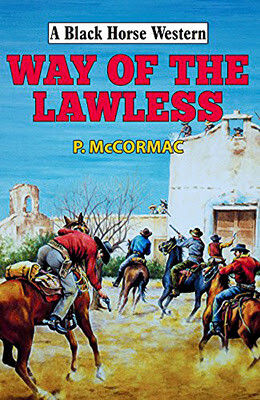 Trouble seems to follow the pals and they end up in the confines of the brutal Los Pecos penitentiary. Breaking out they flee over the border into Mexico only to fall foul of the notorious bandit Barca. They recruit a bunch of escaped convicts to fight Barca only to find they have made a pact with one pack of devils to fight another pack of devils. On top of that the prison guards are out scouring the countryside for the escapees. With enemies closing in on all sides there is nowhere to run. Could this be the end of the trail for Butch and Joe? Since The Crowood Press took over the publication of Black Horse Westerns from Hale I’ve noticed that many of the books now list not only the previous output of the author but also list the books they've written under different pseudonyms and this is one of those. P. McCormac is the author’s real name and I also discovered he’s written under a few different names too. Even more surprising is that I have never read any of his books whatever the name on the cover. Butch Shilton and Joe Peters are a very likeable couple of lead characters that often squabble with each other. This, along with their descriptions and fighting with their fists as much as their guns, brought to mind that great Spaghetti western duo Trinity and Bambino and that for me was a very welcome. As the story progressed and Shilton and Peters rounded up small group of convicts to take on Barca to help a small Mexican village as much as for their own revenge I started to think this book was going to be another take on The Magnificent Seven, but I needn’t have worried as no sooner did I have this thought than McCormac added a twist and the tale headed off in its own direction. The story is filled with action, excellent dialogue and terrific descriptions – particularly of fist fights, so I’ll finish by saying this has to be a book that I believe most fans of westerns should enjoy.